England face Croatia in the second World Cup 2018 semi-final tomorrow evening. The World Cup 2018 has been a brilliant spectacle thus far, and Gareth Southgate’s team will be competing in their first semi-final for 28 years. 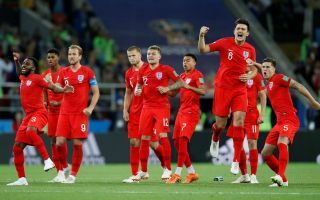 England reached the semi-final after they defeated Sweden 2-0 and, in doing so, reached their third semi-final after the World Cups in 1966 and 1990 with goals from Dele Alli and Harry Maguire. Meanwhile, the Croats beat hosts Russia on penalties in a dramatic affair – they will be looking at Luka Modric and Ivan Rakitic to inspire them once again. According to the Evening Standard, Jamie Vardy is a fitness concern with a groin injury, however, he did make the bench in the last game. As for Croatia – Danijel Subasic (hamstring) and Sime Vrsaljko (knee) are doubts too as per the report. England will be hoping they can reach their first final since 1966, but the Croats will represent a tricky test and have a good record against the Three Lions. When is England vs Croatia and what time is kick-off? England face Croatia at Luzhniki Stadium, Moscow, on Wednesday July 11, with kick-off scheduled for 7pm BST. The match will be televised live on ITV One, and can be streamed live online via the ITV Hub.